When the weather takes a turn for the worst and the kids get restless, or if you just want to catch up with your favourite show, a TV and satellite system means you can sit back, relax, and enjoy a bit of ‘home away from home’ while you’re on holiday. There are a number of options available, so we’ve asked SmartRV’s Patrick Frick some common questions to help explain the basics of satellites. 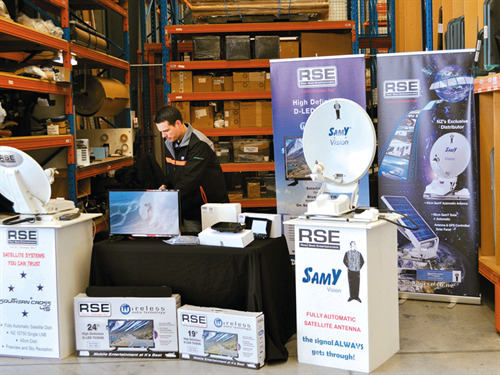 What options are available for satellite equipment? The deciding factors here are, firstly, how often you want to use the satellite dish and secondly, your budget. The cheapest option would be a terrestrial antenna. You can buy one of these for around $200–$300. This will only give you reception in urban areas, but it is small in size and a cheap option. The next option is a portable satellite dish that you can store in a locker and only connect when in use. These vary in price from around $300 to $500. A key benefit is that because it is not permanently fixed to your vehicle, you can also use it in other vehicles or a bach. Portable satellites offer good reception, but they can be difficult to set up. Wind-up satellite dishes are the next best option. You can get these for around $1500. They are permanently fixed, and you use a crank handle to wind them up before adjusting their direction. These are the cheapest permanently installed satellite option and will do a good job, but it can be time-consuming to get them into the correct position. The dish requires you to drill a hole all the way through your roof to the inside of the motorhome due to the crank handle mechanism. The most user-friendly option is a fully automatic dish. These start from around $2500 but can be as expensive as $4500–$5000 depending on the make, model, and individual features. The dishes at the top end of the price spectrum also have a solar panel attached to the back, assisting you to charge your batteries. This could also be a key feature if roof space is a concern. Fully automatic dishes operate with the press of a button and do all the rest for you. They will also automatically retract in case you start the engine. What do I need to know before I buy equipment for my motorhome/caravan? Mainly it comes down to budget, roof space, and user-friendliness. If you are not particularly confident with entertainment electronics, then the automatic dishes are your best choice. Can I install the satellite myself? This depends on your skill set and how comfortable you are using tools. Any dish can be installed by a technically savvy person, but keep in mind that this might void your warranty. You need to have a good set of tools, be confident with basic electrics, and always measure twice and drill once. Make sure you secure the dish sufficiently and only drill if you have to. Take into account that the dish will rotate and tilt, so make sure there are no hatches in the way. Also, be sure to take a lot of care when sealing any holes so you don’t end up with a water tightness issue. If you feel unsure, contact a trusted installer who can help you choose the right option, provide aftersales service, and install the satellite dish for you. Are there any common problems with satellite equipment I should be aware of? There are not a lot of issues with satellite dishes in general. A few things to mention are that the satellite dish will only receive a signal if is unobstructed. This means if you are parked against a wall or between buildings, you might not receive any signal. Also, the quality and age of your TV makes a big difference on how well it receives and holds the signal. Keep informed if there are any changes to the satellite network, as they do change from time to time, which could mean that you have to update your TV to receive some channels.